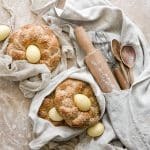 Recipe for Easter Bread Nests, a fun way to serve bread and dyed eggs for the spring season. Braided whole wheat flour dough, topped with sesame seeds, then shaped around a hard boiled egg. This bread has a lovely texture, slight sweetness, and makes a great Easter centerpiece. Best eaten fresh and within a couple of days at room temperature or store in the fridge for up to two weeks. Add 3 cups boiling water, 3 Tbsp vinegar, and 3 Tbsp Turmeric powder to a medium bowl. Gently place eggs into the dye with a spoon. Let sit for two hours or until they have a nice yellow coloring. Remove from dye and gently pat dry with towel. Refrigerate until time to bake with bread. Combine warm almond milk, 1 tbsp sugar and yeast in bowl of stand mixer. Let sit 5-10 min until foamy. Stir together sifted wheat and bread flours into a medium bowl and set aside. In a separate bowl whisk together butter, salt and remaining 2/3 cup of sugar. Add sugar and butter to yeast mixture and blend on medium speed with paddle attachment. Incorporate eggs until well combined. Slowly spoon flours into mixer bowl at medium speed. Line two baking sheets with parchment paper and preheat oven to 350 F.
Place dough on a lightly oiled surface. Punch down excess air and divide dough into 12 pieces. Take 3 pieces and roll into 12 inch strands. Place the strands vertically in front of you and squeeze the tips together. Braid the pieces until you reach the end. Curve the braid into a circle and pinch the two ends together, creating a wreath shape. Transfer bird nest to baking sheet. Repeat with remaining dough. Place a dyed egg in the center of each nest. Cover baking trays with the four nests and let puff for an additional 30 min. Brush egg wash across dough and into braided creases, avoiding eggs. Sprinkle sesame seeds onto dough. Bake for 20-25 minutes or until golden brown. Thermometer inserted into thickest part of loaf should read 190 F.
Let cool 10-15 minutes before serving. Create different colored eggs with natural dye. Mashed blueberries for blue or beet juice for a soft pink.